Philadelphia Rapid Transit Co. operated a fleet of 200 double-deck buses. Built in 1925 and 1926, double-deck buses served Routes A, C and D until 1948. Philadelphia Rapid Transit Company's first large fleet of buses were double-deckers powered by an advanced gas-electric drive system. circa 1926 postcard view of no. 206 on Roosevelt Boulevard. credit: Library Company of Philadelphia, used with permission. 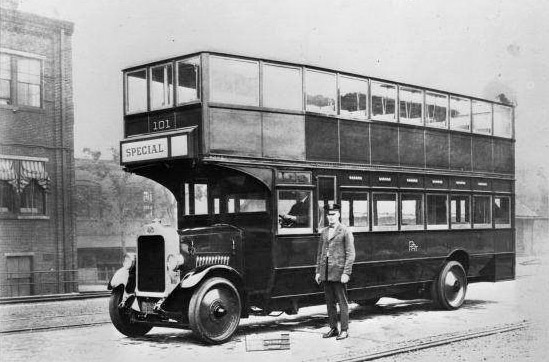 Built in two batches in 1925 and 1926, the buses were delivered riding on four solid rubber tires and with no roof over the upper deck (see photo at left). Because inclement weather reduced their passenger-carrying capacity by half and because of their bone-jarring ride, the upper deck was soon enclosed and pneumatic tires installed. With the upper roof installed, total height of the bus was 13 feet 9 inches. Top speed was 26 mph. The photo at the top of this page depicts a demonstrator bus (numbered 101). The 125 buses delivered in 1925 were numbered 201 through 325; the 75 buses delivered in 1926 were numbered 401 through 475. 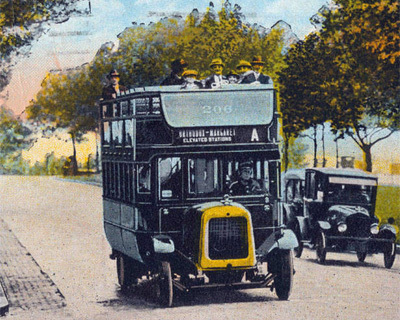 The builder was the Yellow Coach Company (Yellow would later become GMC Coach). These large vehicles were equipped with seats for 71 people: 32 on the first floor and 39 on the upper deck. Loading and unloading was slow compared to a trolley car, because entering and exiting passengers all needed to file through the one narrow front door by the driver. The rear door was for emergencies only. Because the roof was an afterthought, the upper deck ceiling height was severely limited at just under 5 feet 3 inches. Despite the cramped head-room and steep spiral staircase, in his nostalgic 1976 volume Philadelphia In Motion J. W. Bourse Jr. remembered that most riders seemed to prefer the upper deck (see 1940 photo at right). 1940 photograph shows double-deckers' later appearance. Assigned to Route C (Broad Street), Route D (Chestnut and Walnut Streets) and Route A (Roosevelt Boulevard) these machines were a common sight on Philadelphia's avenues for well over twenty years. George Metz notes that in November 1946 nearly half the fleet (85 buses) was still in service, with the final double-decker finally taken off the street in March 1948. The December 1924 issue of Electric Railway Journal briefly turned its attention from the latest trolley car designs, to an innovative concept for new gas-electric double-deck buses about to be built for Philadelphia. Here is that article, in its entirety, thanks to the generosity of historian Andrew W. Maginnis. AFTER a series of exhaustive tests, the Philadelphia Rural Transit Company, a subsidiary of the Philadelphia Rapid Transit Company, has ordered 225 gas-electric buses which will differ in several important respects from earlier designs. The placing of the order was mentioned briefly in this paper, issue of Dec. 6 . Engines, chassis, and bodies will be built by the Yellow Coach Manufacturing Company, while the electrical equipment will be supplied by the General Electric Company. Mitten Management has ordered 25 additional buses for use in Buffalo. The total cost will be about $3,000,000. Power will be supplied by a standard six-cylinder engine of 4-1/4 in. bore and 5-1/2 in. stroke, rated at 108 hp. at 2,200 r.p.m. This [468 cubic inch] engine will drive a generator permanently connected electrically to two 20-hp. electric motors mounted side by side on the chassis frame. These in turn will be mechanically connected to the rear wheels by drive shafts and bevel gears. The speed of the bus will be controlled by movement of the throttle of the gasoline engine. Clutch, transmission, and mechanical differential have been eliminated. Because of that and also because of the constant torque of the electric motors, the wear and tear on all moving parts, as well as the chassis and body, is expected to be much reduced, insuring a greater length of life for all equipment. The generator, known as the GE-1098, is compound wound with a differential series field, the shunt winding being excited by a small generator which forms a part of the main generating unit. The exciter obtains its field current from a 12-volt storage battery. This arrangement of windings provides high current and low voltage at starting. Due to the inherent characteristics of the generator, as the vehicle accelerates the voltage increases and the current decreases automatically until normal running speed is reached. For a given throttle opening the output of the generator is substantially constant under all road conditions. In this manner the necessary torque for acceleration or hill climbing is provided without overloading the engine, and with a smooth change of speed. The generator is designed to transmit the output of the gas engine within practical limits of operation. The bus is designed for a normal maximum speed of 26 m.p.h. on a level roadway. Both the generator and the motors, which are known as GE-1079, are designed on the basis of 125-volt operation, and are self-ventilated. The motor frames are long and of small diameter, permitting assembly on the chassis without sacrifice of road clearance. Acceleration and all speed changes are obtained solely by variation of the engine throttle, which is controlled by the usual accelerator pedal. As the engine speed increases, the generator voltage rises. The operator need not remove his hands from the steering wheel except to apply the emergency brake. There is no electrical controller for the motors, nor are any electrical adjustments made by the driver when running the bus. A small switch is provided having an off position and reverse for backing. This is connected with a single hand lever to the left of the steering post. 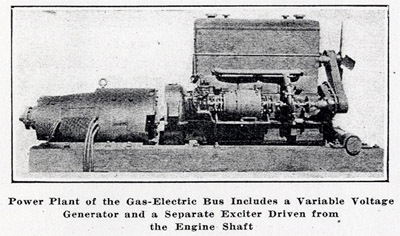 Before this design was definitely selected, competitive tests were run with the experimental gas-electric bus and a bus having the usual gear drive, with clutch, transmission and differential. The accompanying illustrations show the chassis and exterior appearance of this experimental bus. Several minor changes in design will be made when the new buses are built. The gas-electric bus has been in regular service from Aug. 1 up to the present time and has covered more than 13,000 miles. It is said that the tests made show somewhat lower fuel consumption for the gas-electric bus for a given service, and at the same time a higher rate of acceleration and schedule speeds. These are important factors in city bus operation. 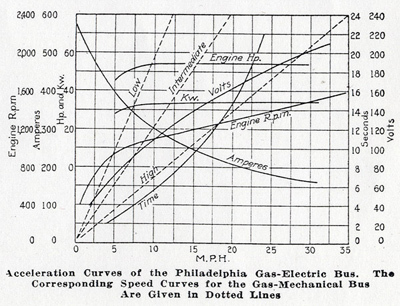 An important point which was developed was the fact that the engine of the gas-electric bus actually makes 20 per cent fewer revolutions when running under city conditions than does the engine of the bus equipped with mechanical drive. This is because with gas-electric transmission it is impossible for the driver to race the engine, and it is also difficult for him to stall it. The great advantage claimed for the new design, however, is its simplicity. There is comparatively little electric wiring and no controller. The various parts are easily got at for inspection and repair. Elimination of more than 2,000 movements of the gear shift per bus per day is expected to reduce maintenance costs and prolong the life of the chassis and body. Moreover, the electric drive is silent and the customary noise and jerk of changing gears at the time of starting will be absent. The two-motor drive permits a better distribution of power to the rear wheels when going around a curve. In the event of the failure of one motor, the bus can be brought back to the garage on the one remaining motor. The fact that the bus cannot be put in gear when going down hill is not considered a drawback because there are no steep grades on the routes where the buses will be operated. The buses are of the double-deck type and have a seating capacity of 66. The weight of the completely equipped gas electric bus will probably be several hundred pounds greater than that of a mechanical drive bus, but exact figures are not yet available. The first of the buses will be operated on the Broad Street route for which a franchise was recently obtained. Additional routes, however, have been planned. 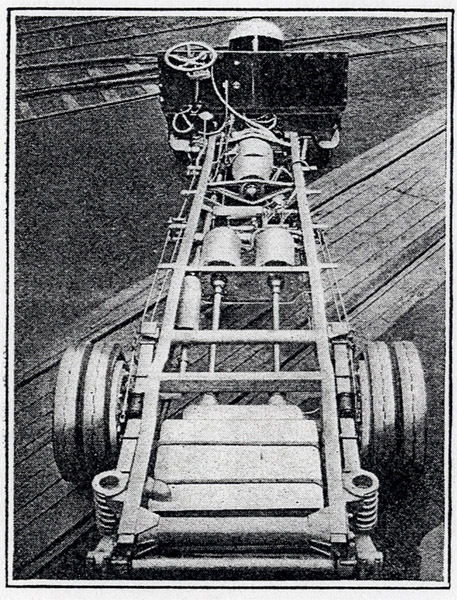 At Left, Chassis of Experimental Gas-Electric Bus, Showing Power Plant and Individual Motor Drive for Each Rear Wheel, Eliminating Differential.